A stormy evening in April 2012 saw a friend and I heading out for dinner at The Botanist: a Mitchells & Butlers pub on the site of the old Bar Ha Ha on Berkeley Square. Having attended their first birthday party the week before, I had been invited in with a friend to enjoy a three course meal to find out how they were getting on, a year after our first visit. The venue hasn’t really changed that much in its first year: a courtyard garden at the front leads through to a spacious bar area, with a separate dining room and a few small ‘snug’ areas for more intimate meals. A selection of draught beers and ciders, along with wines ranging from £15 to £46 per bottle and various cocktails make up the drinks menu, but our evening was all about the food. One thing that has changed since our visit of a year ago is the addition of the fish menu. Boards both inside and outside the building advertise the selection of fresh fish available that day, and its price. You can then choose how you would like the fish cooked and the sauce you would prefer to accompany it, as well as choosing one or more side dishes to accompany your meal. All of our dishes on the night, however, were selected from the oversized menus that had been brought to our table – and the specials menu, which includes “scallops of the day”. 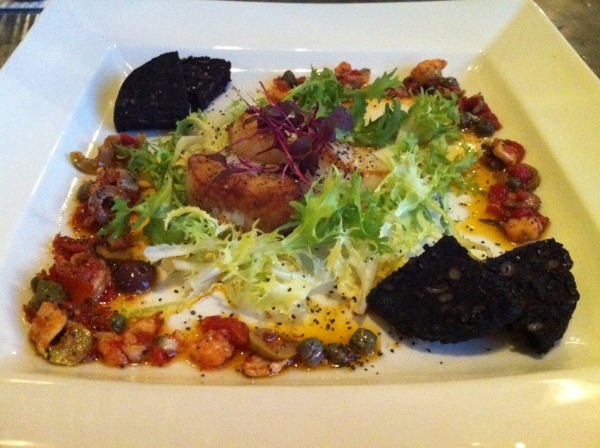 The scallops, she says, were beautifully tender, but the surprise inclusion of anchovies (which weren’t mentioned on the menu) didn’t appeal – she’s not a fan! Once she’d removed them, however, she was more than happy with the tomato, caper and olive-based sauce that accompanied her dish. 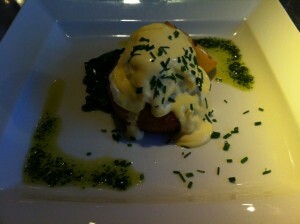 My salmon fishcake with a poached egg, spinach and Hollandaise sauce (£6.95, also from the specials list) was a bit of a mixed bag. While the egg was perfectly poached and the fishcake crisp and golden on the outside, the potato to fish ratio wasn’t great and the Hollandaise had split a little. Sadly, things went from bad to worse. 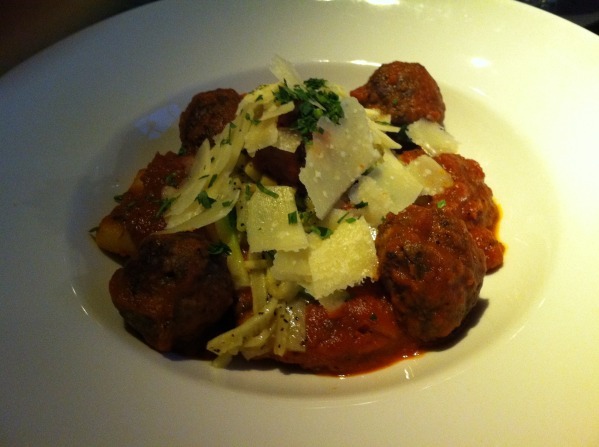 I had ordered the mozzarella-filled beef and pork meatballs (£11.95) for my main, served with a tomato and saffron sauce and pasta, and had to send my plate back to the kitchen. The meatballs were overcooked: dry, tough and overcooked, with no sign of the mozzarella filling. The waiting staff were very apologetic, and fortunately version two was much better. The meatballs were full of flavour, and the mozzarella filling was generous and oozed out of the centre perfectly when cut. I couldn’t really taste much saffron in the sauce, but it went well with the meatballs and the pasta was cooked al dente, which made me happy. 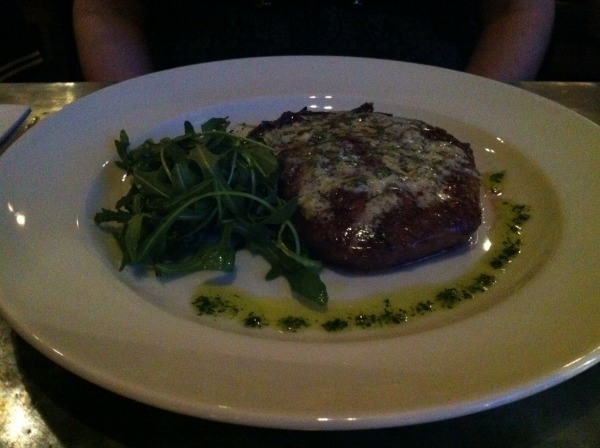 My dining companion is a bit of a steak fiend, and so ordered the ribeye with fresh horseradish and parsley butter (£17.95), opting for a side salad instead of the chips with which it is normally served. No complaints with the flavour of her meal, but she commented that the steak was close to medium rare than the rare that she had asked for. At the start of our meal, the large table next to us was unoccupied, but was filled during our main courses by a large, loud group who were obviously celebrating something. 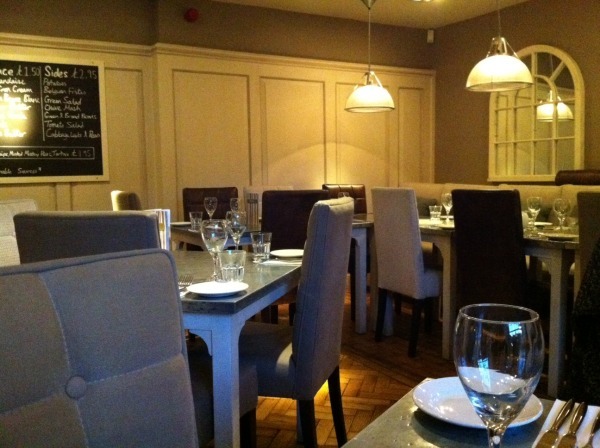 The Botanist staff had been charming and helpful for the entire meal, but this was stepped up a notch at this point, when everyone in the area where we were seated was discreetly apologised to, and asked if they wanted to move to a quieter table. A nice touch. Having seen the dessert menu, we decided to go for a third course, despite complaints from our stomachs! 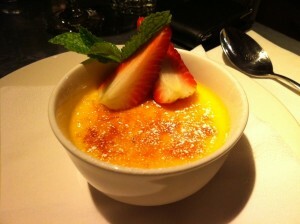 I had been swayed by the creme brulee (my second of the week! 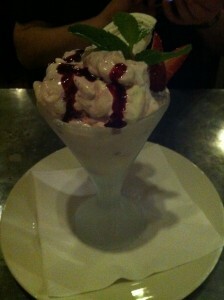 ), this time with white chocolate (£5.45). White chocolate does bring with it the risk of an overly sweet dessert, but this was rich and creamy without being too sickly, and with a crust that splintered perfectly under the spoon. For Laura, the summer berry and bilberry Eton Mess (£5.25): an enormous portion of cream, large chunks of meringue and tart berries – simple, but tasty. Bar the slip up with my main course, we were more impressed with this evening than on our visit of a year ago: the staff were fantastic, and the menu appears now to have bedded in. One of our comments on the previous visit was that the menu seemed a little confused, with “wannabe fine dining” options sitting alongside bargain pizza deals on one night of the week. The Botanist finally seems to have found its place, targeting the slightly-more-upmarket-bar-going crowd. It’s not the cheapest of venues for either food or drink, but the absence of many empty tables suggests that it’s a venue that has now made its mark on the Triangle.